A rivet is a permanent mechanical fastener. 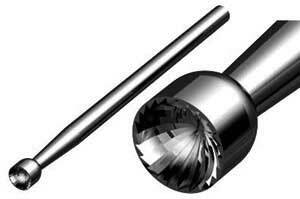 Before being installed a rivet consists of a smooth cylindrical shaft with a head on one end. The end opposite the head is called the buck-tail. On installation the rivet is placed in a punched or pre-drilled hole, and the tail is upset, or bucked (i.e., deformed), so that it expands to about 1.5 times the original shaft diameter, holding the rivet in place. To distinguish between the two ends of the rivet, the original head is called the factory head and the deformed end is called the shop head or buck-tail. This is a YouTube video. Click on the image to view the video. 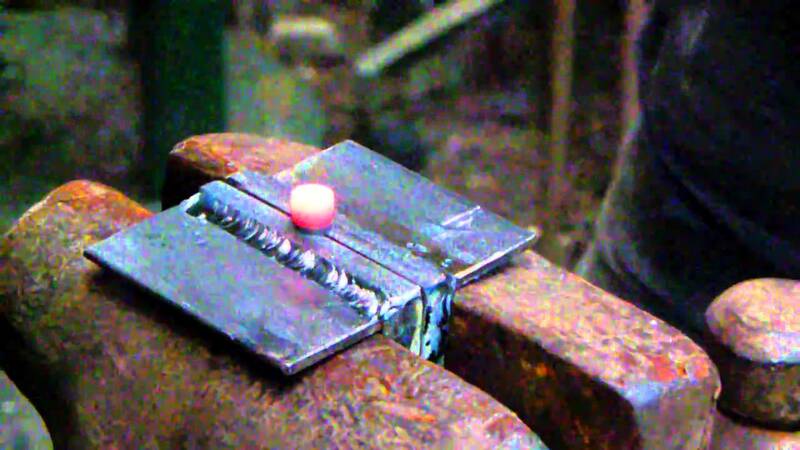 Spring swage for forming tenons and/or rivets. 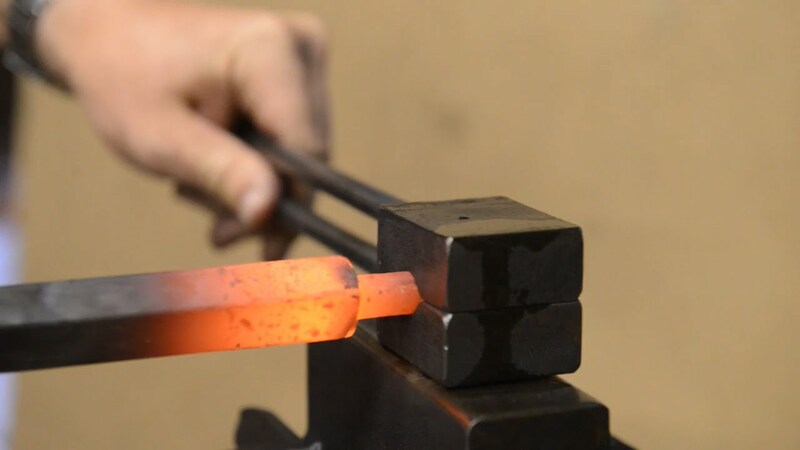 First round stock, the diameter of the final rivet, is heated and inserted into the rivet block with the exposed stock hammered into the head of the rivet. Quenching the rivet block will help free the rivet from the rivet block. 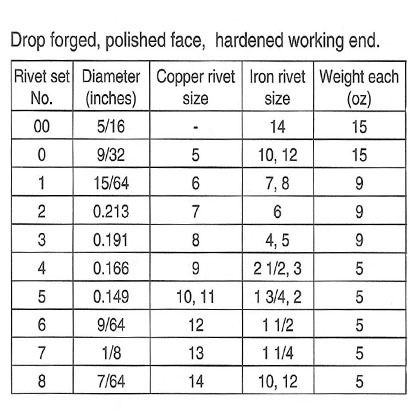 Conversely you could use a number methods to get the rivet the appropriate diameter. 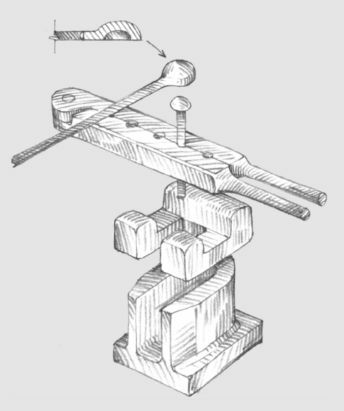 Shown above is a custom "vice tool", a spring swage rivet tool, and a set of monkey tools. The rule of thumb is 1-1/2 the diameter of the rivet stock to form the (one) head. Also, keep in mind that it is better to make the rivet a little longer than you might need and cut off any excess when you go to use it. This also allows you to make a batch of rivets ahead of time so you have them available whenever you need them. tossing them into the fire and hoping. 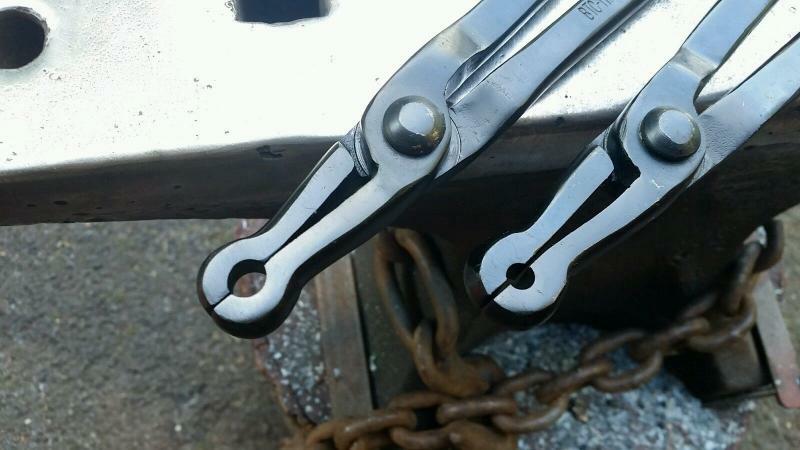 Tongs for holding rivets when they're hot. Use the tool on the top-left to put the rivet into the fire without losing it. When you take it out of the fire you can start to put it down on a flat surface and grab it with the rivet tongs when it rises out of the holder enough. Hardy rivet set for setting rivets. Shows how all of the tools work together. 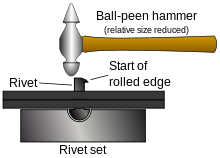 You can either use a ball peen hammer to flatten the end of the rivet or use the rivet punch shown above. Once you have formed the rivet, place it upside down into the dimples in the rivet header. 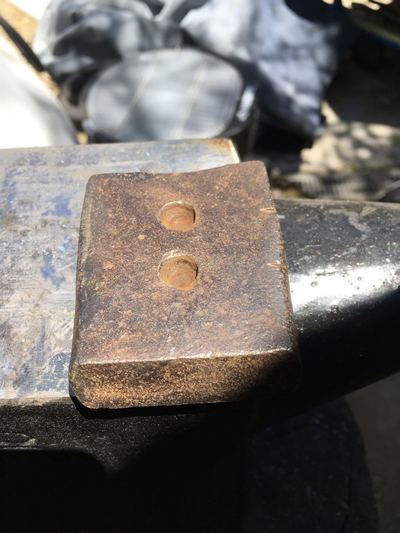 Then put the stock to be fastened over the end of the rivet and "smash" down the end of the rivet to complete the binding of any materials being riveted. 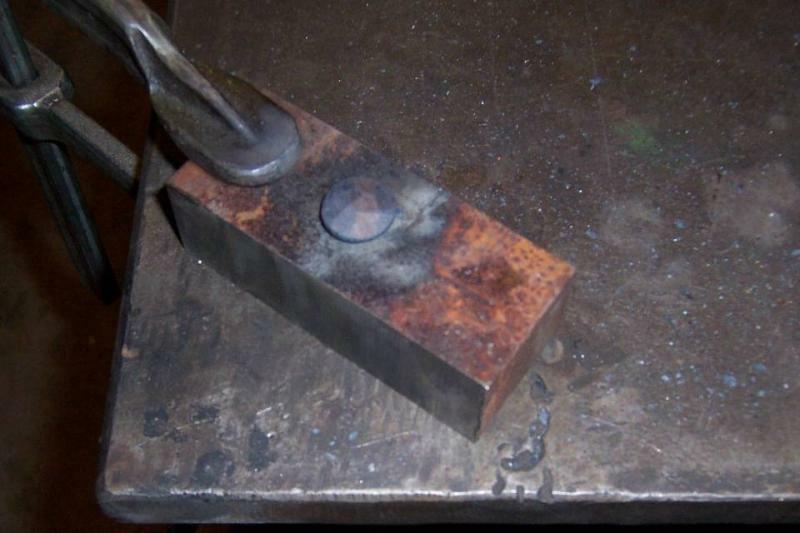 Unless you do this often you are likely to find that the rivet loses it's heat before you can get it completed. 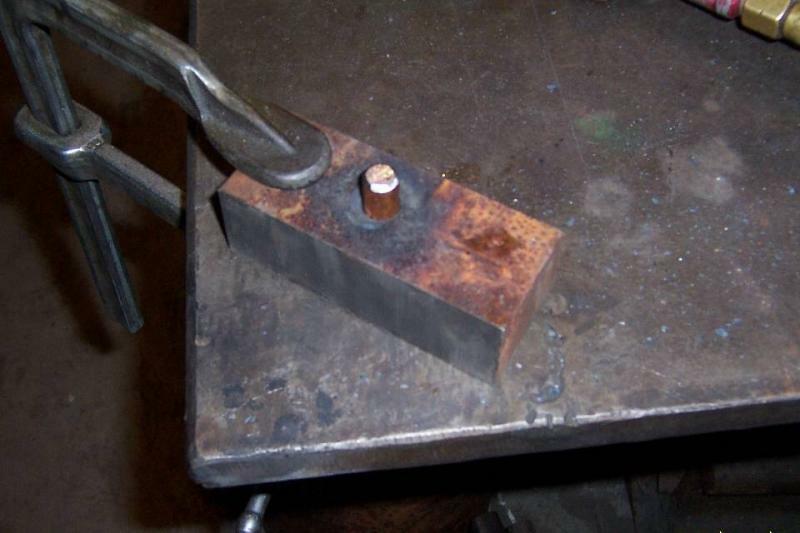 What I do is put the rivet in the header, add the stock over the rivet, then I use my oxy-acetylene torch to reheat the tip of the rivet and then hammer it with the rivet punch forming the end of the rivet. them into the fire and hoping. Recently, I was doing my usual perusing of Pinterest looking for ideas, I ran across this image of a cup bur tool. For years I've used a burr in my pneumatic angle grinder. 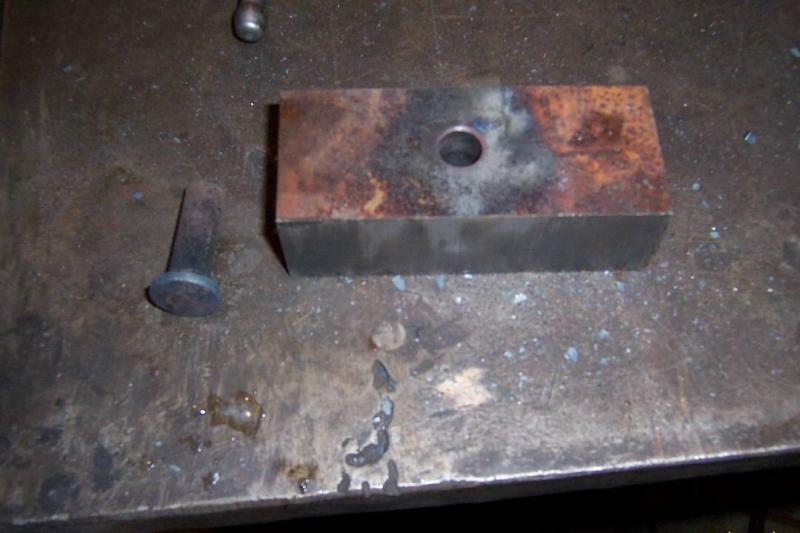 I came across a picture of a cup burr used to round off the end of a rivet after it has been installed. Now, this is mainly used in the jewelry industry, but I don't seen why metalsmiths couldn't use a similar burr to clean up rivets in tongs, etc. Stay tuned to this page, I'll post new information when I find an appropriately sized cup burr for the size rivets we commonly use in our work. I'll also provide a link to where you can buy this tool.